Compact and easily tucked away, the Beko UL548APW under counter fridge is the perfect addition to any home or workplace. Spacious and with brilliant cooling capabilities, you can easily fit a weekly shop inside, all within easy reach. Rated an excellent A+ for energy efficiency, this fridge offers brilliant cooling while also keeping your bills down. With everything in such easy reach, you will not need to have the door open for as long, saving even more energy. Comfortably accommodating four bottles of wine or pop, the included chrome wine rack keeps them safe from rolling around inside. A salad crisper offers excellent storage for fruit and veg, keeping items fresher for longer. Four height adjustable glass shelves provide plenty of space while also offering the ability to move them around to fit in taller or bigger items. Easily separate fresh, raw and cooked items to avoid any contamination. The door features three balconies, ideal for larger bottles and items as small as eggs. An antibacterial door seal ensures bacteria cannot form and enter the fridge, keeping items fresh while the auto defrost feature prevents ice building up. 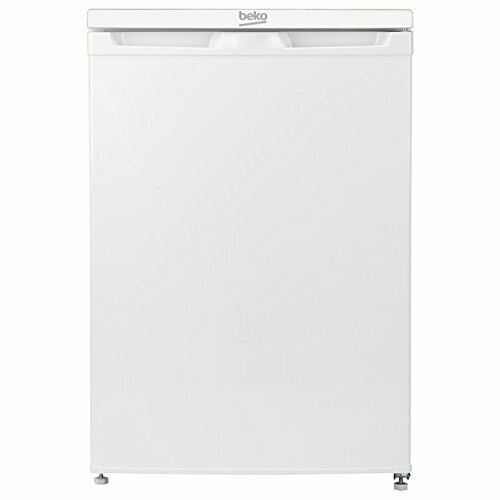 Small enough to be tucked out of the way, the Beko UL548APW under counter fridge is the perfect any addition to any home or workplace. Offering spacious cooling capabilities, this fridge easily holds a weekly shop, all within easy-reach for your convenience. Rated A+ for energy efficiency, this offering from Beko delivers exceptional cooling power by using lower levels of energy. With the space to comfortably hold four bottles, the chrome wine rack is ideal for wine bottles and 2L bottles of pop alike. A large salad crisper drawer provides the optimum storage space for your fruit and veg, keeping it fresher for longer. 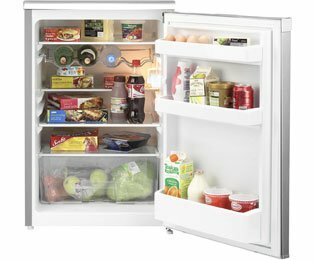 Four height adjustable glass shelves help to make fitting larger items inside the fridge, offering spacious storage overall. Easily separate fresh, raw and cooked items to avoid any contamination. Three door balconies offer a stable space to store everything from larger bottles to eggs. Your items are kept fresh and free of bacteria inside the UL548APW. The antibacterial door seal ensures bacteria cannot form or enter the fridge. The auto defrost feature works independently to remove any ice that may have formed on the back wall. The reversible door means this fridge is adaptable to suit any home or kitchen layout. With integrated handles on both sides, reversing the door is made easy.